The installation of the Eclipse IDE and its configuration for software development on the TQ-modules is described on this page. If you follow on this page the link to the desired Eclipse package (Eclipse CDT 8.0 for Indigo), there is a download link for the different architectures in the right column. The package Eclipse-platform only contains the platform and no language-specific plugins. These must be installed separately using the plugin manager. An existing installation of Eclipse can be used as well. Workspace: A workspace has to be created after Eclipse is launched. The workspace is in a folder in the file system. Projects can easily be referenced within the workspace. Different workspaces are primarily useful for different programs or for different purposes (e.g., a workspace for embedded projects, a workspace for web development, a workspace for Java projects). Starting Eclipse by double clicking in the file explorer does not take on the environment variables of the shell. The first way to use Eclipse with the environment variables is to start Eclipse from the console. Press Finish in the next window. Assign a project name in the wizard (e.g. Hello World) and remove the checkmark at use default location. Then specify the location of the existing project e.g. /home/user/src/hello_world/. Select Cross-Compile Project as project type and Cross GCC as toolchain. Close the wizard with Finish. - The project with existing source files should now show up on the left of the Project Explorer. Now the automatic makefile has to be disabled in the project properties. Right click on the project name and select Properties in the context menu. 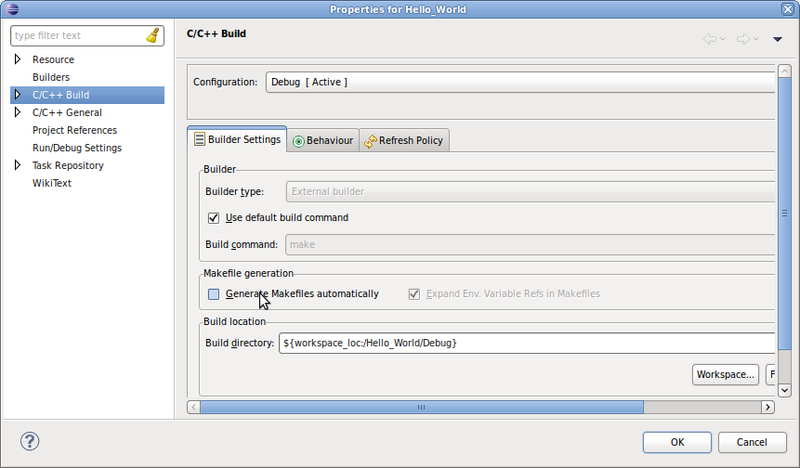 Select menu item C/C++ Build in the setting dialog. Turn off the option Generate Makefiles automatically there. Build the project with a click on the hammer. The binary with the additional information about the architecture, in our case “arm”, is in the Project Explorer after a successful build. In Eclipse a project can be compiled for a different platform. Therefore a call of the target-specific compiler is required. Using the C compiler that comes with the package LTIB, the necessary settings in Eclipse are illustrated here. For this example, this is GCC 4.3.3. 2. Open properties of an Eclipse project (right click on the project in Project Explorer → Properties) and note the configuration shown above. 3. Click on Settings under C/C++ Build and mark GCC C Ccompiler at Tool Settings. 5. Now the include directory of the target Linux has to be given to Eclipse to compile. For this purpose expand GCC C Compiler and select the entry includes. 7. Repeat step 4 for the GCC Linker. 8. Click on Libraries under the GCC Linker. 9. Add the directories /opt/ltib/rootfs/lib and /opt/ltib/rootfs/usr/lib to the Library search path(-L). 11. Open the tab Binary Parsers, deselect the Elf Parser and select the GNU Elf Parser. 14. Apply changes with Apply and OK. Copying directly into LTIB RootFS only works if the user rights of Eclipse permit to write to that location. The rights of the target directory must be set accordingly before, if necessary. 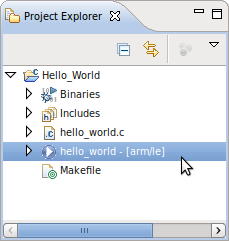 A “Hello World” demo project was created. With a correctly installed and configured ELDK this project should compile with Eclipse and CDT. To import the project simply select File > Import… in the menu. Select Existing Projects into Workspace in the wizard. In the next form select the downloaded ZIP archive and complete the import with “Finish”. Should there be problems when compiling, you can first run the build process on the console with a direct call of make. It will then create an executable program.